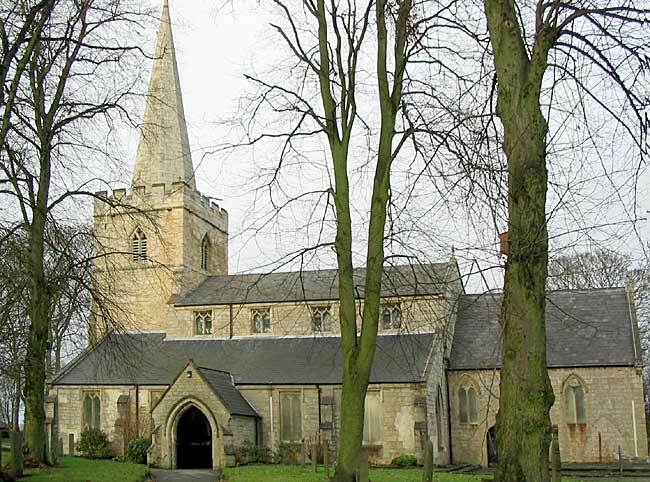 After leaving Kirkby Hardwick, the party soon reached Sutton-in-Ashfield, where an ancient, interesting, and well-cared-for church is to be seen amidst modern surroundings. Mr. G. G. Bonser read the following paper. Church of St. Mary Magdalene, Sutton-in-Ashfield. There is no mention of a church here in Domesday Book, but Mansfield is stated to have had two churches and two priests. There can be little doubt one of these churches was at Sutton, the largest parish in its great soc, or court, its south town; and the remains of part of a Norman arch, now built into the west wall of the south aisle, together with the fact that the great family of Sutton was settled here, form almost conclusive evidence. The church was presented to Thurgarton Priory A.D. 1189 by Gerard, son of Walter de Sutton. In the pipe rolls of 1188 it states that Walter de Sutton paid a composition of twenty shillings for the right to cut vert (green-stuff) in his bailiwick, and the grant of the church was confirmed by Robert Fitzranulph, who was sheriff in 1189, as appears from his witnessing a charter of John, Earl of Mortain, to Nottingham in the same year. Thoroton states that the parish was the ancient demesne of the crown, and not gildable, except the fourth part which was held by Jordan de Sutton, temp. Edward II. This would mean that they held the whole of the cultivated land in the parish, the rest being forest and unenclosed. Of the present building the oldest part is the two eastern bays of the north arcade which date from 1170-80. They are the plain round pillars of the transitional period surmounted by the square abacus. The additional bay to the west, together with the south arcade were added towards the middle of the 13th century, and it is pleasing to see that the character of the whole was preserved. A slab now placed at the foot of the north-west respond also dates from the E. E. period, and it is noticeable that the caps of the two south-western pillars are octangular, while those to the east are circular, with deep water-mouldings. An interesting feature of the south-west respond is the carving of Roman numerals near the top, no doubt placed there by some early and practical parson to serve as an internal sun-dial. The Eastern respond of the north aisle is the most beautiful feature in the church, no doubt replacing a circular predecessor, and probably added when the chancel arch was built and the first stone chancel. The only original window now in the latter is the extreme east one on the south side. The arch, as may be seen, has shafts of keel-shaped mould, while its chief feature is a roll mould standing out boldly. It is crushed out of shape particularly on the north side, while the chamfered stones are quite plain. The base of the north-east respond is well moulded with a clustered shaft, surmounted by an elongated cap with human heads, with a characteristic tuft of foliage between them. It was much damaged in 1749 by the insertion of beams to carry the north gallery, but has been restored. The piscina in the south wall has a lancet head with simple moulding, with a projecting bowl, but oniy a shallow square hollow without a drain. The small lancet window in the tower seems to be of the same period, and may be an insertion from the previous tower. The east window has been recently (1909) inserted, replacing a decorated one of c. 1330, which is being preserved on the outside wall. The two-light window in the south aisle, together with the two statue brackets, and a piscina, having a shallow bowl, but no drain are of the same date (1320-50), and seem to indicate the existence of a chantry; but, so far, little evidence has been found to support it. Robert Clerke's name appears in the list of corrodies and pensions paid on the festival of St. Michael the Archangel, in the second and third years of Philip and Mary (1554) as "Robert Clerke cantarist in ecclia de Suttone-in-Ashfelde per ann. iiij., li xijs. iiijdi" But in some legal proceedings between him and Thomas Langford four years later he is described as priest and chapleyne. The tower is late decorated ; it has belfry windows of two lights, with a quatrefoil above and angular heads. It was built soon after 1391, for John de Sutton, of Lincoln and Burton Lazars, in his will of that date, left £20 for its erection. On the floor of the chancel may be observed a sepulchral slab marked with a bow and arrow, and no doubt that of some high official of the forest. It originally had a sling and bugle, but this was cut off to make it fit into its present place. Grimm, who was here in 1787, gives an illustration of it with the following inscription, " Hie Jacet Johannes de Moun," but Stretton, who was here in 1819, read it as " Hie Jacit Joan de Sutton," suggesting that he died about 1305. The most interesting thing in the church is the movable stone piscina which is quite remarkable, giving an early and enviable date to the Church. It had been built into the churchyard wall, but being brought inside, it was recognised by Mr. William Stevenson in 1909, and has been carefully restored under his loving supervision, the cost being defrayed by two parishioners. He thus describes it:—"It is an extraordinary example of the work of the scappler, or axe worker, and it is questionable if there is a man living to-day who could do similar work, the axe marks in dressing down the side are as distinct to-day as on the day the work was wrought. . . . One curious detail has come to light in a hole being bored through one of the corner volutes. ... I can only suggest, as a strong cord is now passed through it, a stake has been driven into the ground, and to the top of this the standing piscina has been tied to prevent being accidentally knocked over and broken—such an accident as appears to have finally brought it to an end." Its probable date is about A.D. 1120. The ancient font is unused but is preserved in the tower. It is quite plain but has a large basin, and is probably coeval with the piscina. In the porch are two sepulchral slabs of the 13th century, probably those of William de Sutton, priest, and Jordan de Sutton, knight, who fought with Edward I. at the siege of Hawarden and Rhuddlan castles. The galleries, erected in 1715 and 1749, were removed in 1867; the chancel was rebuilt in 1854; and the present woodwork, east window and organ, together with the beautifying of the sanctuary, were completed in 1909. There are three bells in the tower, replacing those that were removed in the great pillage of the 16th century. The oldest bell has " Glory bee to God on high, 1656," the second, "Jhesus bee our sped," the third, "John Moore, Timothy Gregory, C. W." upon them, while one has the mark of Richard Mellers and another that of George Oldfield. 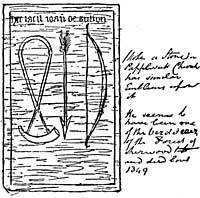 The interesting seal dug up in the churchyard in 1870 by Edward Allin, the sexton, is that of William de Sutton. Archdeacon Trollope was of the opinion that it dated about 1390, and was that of the William de Sutton who was buried at St. Katherine's Priory, Lincoln. But more scientific research has settled the point, and the vicar of Thurgarton, to whom this society owes so much, writes as follows:—"The figures represent ecclesiastics seated in a choir, the upper and lower ranges of stalls being shown in profile. They are wearing birettas and copes, and as under the cope the garment looks more like a rochet than a surplice, this is in favour of their being meant for canons regular, such as were at Thurgarton. Hence it seems not improbable that William de Sutton was a canon of Thurgarton." Mr. William Stevenson writes:—" Up to the present year it has been regarded as the 14th century, but it is now proved to be a work of the 13th century. The chief evidence is the conventional character of the foliage on the front and back of the seal, which indicates a style of ornament that did not survive the third quarter of the 13th century. In the cloisters of Lincoln Cathedral, built by Bishop Oliver de Sutton (1280-99), the above conventional had been superseded by the natural." William de Sutton held the living of Granby 1272, and was most probably passed by its patrons (the canons of Thurgarton) to Sutton-in-Ashfield. In a roll found in the Public Record Office of the tenants of the manor of Mansfield in 1295, under the list for Sutton-in-Ashfield, appears the name of William, the clerk, and on the seal, the device of the tree and the squirrel is probably intended to imply that this William de Sutton hailed from Sutton-in-the-Wood or forest, as distinct from others in the country. The registers date from 1572, both the original paper and the parchment transcript of 1597-1603 being preserved. An interesting entry is that of " Lemuel Tuke, presbiter, sepultus fuit nona die mcnsa [sic] June, Ano Domini, 1670." He was described by Dr. Calamy as "an ancient blind man of the congregational persuasion," ejected from the living by the Act of Uniformity of 1662. It seems he was vicar of Greasley before coming to Sutton, and from a contemporary will in which he was left forty shillings, we learn that at the same time twenty shillings was left to Jacobus Haynes for a funeral sermon. The latter's name constantly appears in the register, and therefore, some doubt may be felt as to Dr. Calamy's accuracy, especially as Tuke is buried as presbiter. The chalice and paten are the Elizabethan ones of 1571. From Sutton-in-Ashfield the Nottingham contingent returned by rail, well pleased with the many interests of the excursion, the favourable weather, and the excellent arrangements made for them by the General Secretary.